– Displays info about now playing song, podcast, video, etc. Familiarizing with a new genre or band? 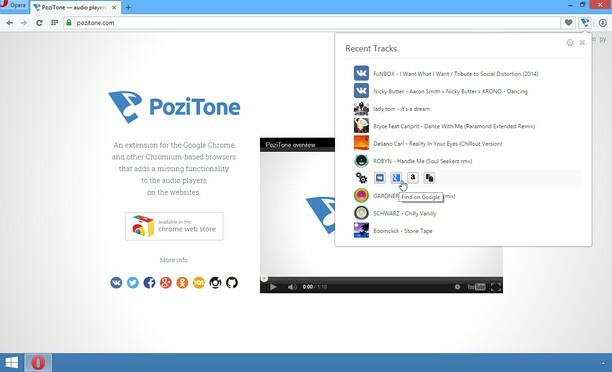 PoziTone will show you track info (its name, artist name) via a pop-up notification on every track change. Want to stop/resume playback, mute/unmute, switch track or add it to playlist? – Click a button in the pop-up notification. – Or, just say a command*! What track played five minutes ago? 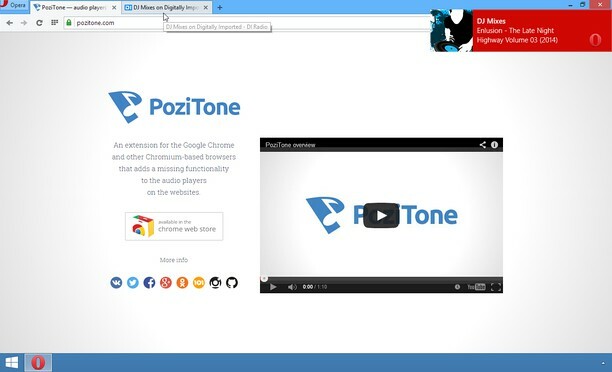 PoziTone keeps information about the last 10 tracks played. Alt+Shift+D — “Add track to playlist”. Alt+Shift+P — “Stop / Play”. Alt+Shift+M — “Mute / Unmute”. Alt+Shift+F — “I like it!” (not preset). Alt+Shift+N — “Next track” (not preset). Alt+Shift+B — “Previous track” (not preset). Alt+Shift+A — “Increase sound volume” (not preset). Alt+Shift+Z — “Decrease sound volume” (not preset). Alt+Shift+R — “Activate the extension” (not preset).